The beauty of Brighton is that it offers so much all in one place. It’s one of my favourite places to go and take photos. I always recommend it to people, if you want cityscapes ✔️seascapes ✔️street ✔️ landscapes. You will not be disappointed. The other day I had time to myself so I arranged to meet up with my good friend John Adams from DadBlogUK to show him what Brighton has to offer. We’ve taken photos there before but it was the middle of Summer and the sun was so harsh, this time it was overcast, gloomy and the sea had a bit of an attitude…this was going to be perfect. Like most cities, Brighton isn’t cheap to park in but knowing that we would only be staying for 3-4 hours meant that we could park at Brighton Marina for free for up to 4 hours. This also gave us the chance to take a few photos around the marina which we wouldn’t have normally bothered with. While we were there one of the workers mentioned what we should have come down yesterday as the waves were crashing over the storm wall…instead, we had calm waters. Also bonus points for naming the bird in the second photo, I was told I had to take it, no idea what it is. The walk from the Marina to Palace Pier and then on to the streets of Brighton is about a 20-minute walk but it does allow you to discover parts of the beach that is always so quiet. The area down here still gives you those seascapes but you never encounter other people so you’re left to your own devices. 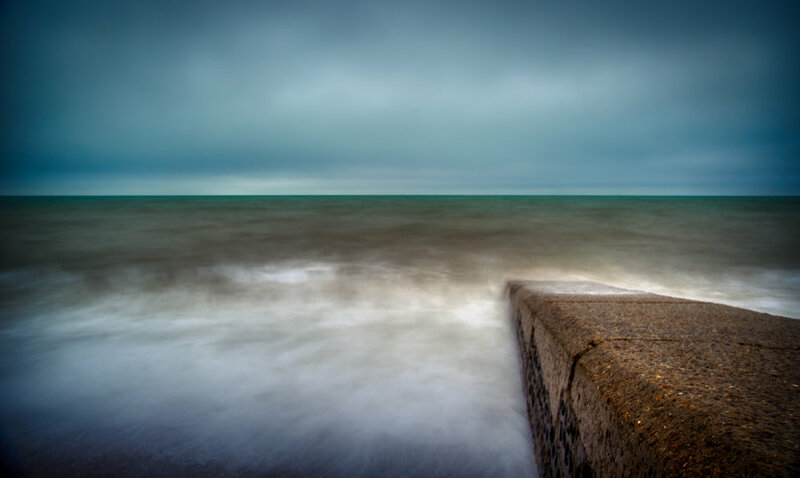 About 200 metres into the walk, just metres from the Volks train station is a little concrete ramp going into the sea and with the crashing waves it gave me the ideal subject that I was hoping for. It’s quite amazing the difference ND filters have and I’m so pleased that I took the time to learn how to use them, I think over the past 12 months or so it’s been the biggest improvement in my photography. In the past, I would have taken the photo and been happy with it but now I look at some of them and smile with pride. John had only recently bought himself a filter and it gave me a chance to share what I’d learnt and hopefully set him on his way to capturing photos that he too will be proud of. Oh, I couldn’t decide which one I preferred, with or without the sign. With limited time to take photos and as we wanted to take some urban shots I knew the perfect place to visit. There is a street that not many visitors know about but is ideal for colour, for portraits and for those urban vibes. The whole narrow road is full of colour from start to visit and it’s always changing from week to week. It is easily my favourite place to get a sudden burst of happiness. Where is it? Well, I’m keeping that a secret for know as whenever I got there it’s always peaceful and I’d hate for that to be spoilt. People of Brighton know where it is. As soon as you turn the corner you’re hit with the colour and the passion of the local artists that have put so much work into it. These two pieces really stood out, the hummingbird is so bold and has so much detail. The second one caught my attention as the lady has such fierce powerful eyes. Any photographer that visit Brighton has to tick one subject off their list, the iconic West Pier. It now sits as a skeleton in the sea with the i360 towering above it. Even though it’s a shell of what it once was the pier is still the most photographed landmark in Brighton. I think I’ve taken photos of it from every angle but still, I keep going back. With the sea bashing at us, it seemed like the right time to once again crack out the ND filter. The camera was all set, sturdy or so I thought. With the seconds counting down all of a sudden the breeze and waves knocked the tripod and the photo you see below is the result. It seems the resulting image is proving to be quite popular. Once we’d captured what we wanted a little walk along the seafront to get some chips and head back to the cars and back to the warm. I hope you’ve enjoyed my little photo adventure.